LIBERAL, Kan. – For the eighth time in the past ten matches, the No. 8 Seward County volleyball team has won from a sweep, defeating the visiting Pratt Beavers in consecutive sets 25-15, 25-21, 25-16. The Jayhawk West win pushes the Lady Saints win streak over conference opponents to 28 matches. The match didn’t start Seward’s favor, as the Beavers jumped out to a 5-2 lead after two blocking errors and a ball handling error. Tapanga Johnson sparked a 4-0 run to take the lead with a kill. Once they took the lead, the Lady Saints never surrendered it, using a series of runs to extend it, until Pratt eventually ended the set with a blocking error, giving Seward the ten-point victory, 25-15. After coasting to a first set win, Seward had to buckle down as Pratt did their best to play upset. The Lady Saints won the first four points of the set, with Giovanna Tapigliani earning half the points with kills, but the tide quickly turned as the Beavers went on a 5-1 run to tie the set five. Esmadar Tavares started a 4-1 run for Seward as they pushed their lead to three points at 9-6. After extending their lead to a set-high five points at 20-15, the Beavers hunkered down, winning five of the next six points to cut the lead to one and forcing a Seward timeout. Coming out of the break, Seward finished the set winning four of the final five points, as Tapigliani pushed the Seward advantage to two sets with the knockout kill as the Lady Saints won 25-21. The two squads traded points to begin the third set, but Seward showed their might midway through the set to put the match away. Leading 11-9, the Lady Saints went on the offensive, winning five straight points with three kills coming off Tapigliani attacks. Seward only increased their lead from there, winning handily 25-16, sweeping the Beavers for the sixth straight time. Seward was lead on offense by reining KJCCC and National Player of the Week Tapigliani, who finished with a match-high 17 kills on 29 attempts (.552 hitting percentage). Freshman outside hitter Djuly Schmorantz joined Tapigliani in double-digits with 10 kills. They both finished two digs shy of recording a double-double. Laura De Pra kept up her impressive freshman season, pacing the Seward offense to the tune of 30 assists. Defensively, two-time reining KJCCC Defensive Player of the Week Nathiellen Machado finished with a team-high 12 digs. 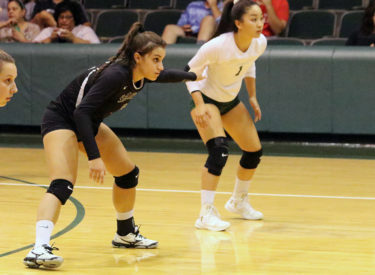 Seward finished with a season-low two blocks as Luz Sierra and De Pra were the lone Lady Saints to step up at the net. Seward will travel to Hutchinson to play in the Allen Samuels/Blue Dragon Volleyball Classic where they will compete against Jefferson and No. 14 Mineral Area on Friday before finished the week against Frank Phillips and No. 17 MSU-West Plains on Saturday.